Maleficent, Sykes, Jafar and Frollo. These are my favourite डिज़्नी villains of all time. Who's your favourite डिज़्नी villain out of them?. HD Wallpaper and background images in the डिज़्नी के खलनायक club. These are my favourite डिज़्नी villains of all time. 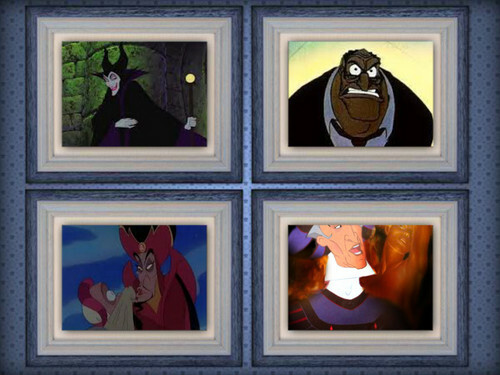 Who's your favourite डिज़्नी villain out of them? This डिज़्नी के खलनायक fan art might contain रंगीन काँच, सना हुआ ग्लास विंडो, बैठक, ड्राइंग रूम, कमरे में रहने वाले कमरे में रहने वाले, कमरे में बैठे, सामने के कमरे, पार्लर, लिविंग रूम, बैठे कमरे, and फ्रंट रूम.